Three words that should always be together. I utilized an old bag of hamburger buns I had laying around and cut out little circles using cookie cutters but feel free to experiment with different types of bread like brioche or even plain white sandwich bread. Stale bread works better for this recipe. Traditionally you use square shaped bread so you can cut it in 4ths or 8ths to make triangles. But I felt creative today and made them circular, don't worry, it all tastes the same. Perfect for parties, these can be made ahead, frozen and baked whenever you're ready. It's easy to make and fun to eat! Now the trick to getting that bacon crispy at the end is baking it ahead of time. 10 minutes at 450F (in a toaster oven or regular oven) to be exact. That way when you bake it towards the end you get crispy, heavenly bacon -- not the soft and rubbery kind. Because that's sad. 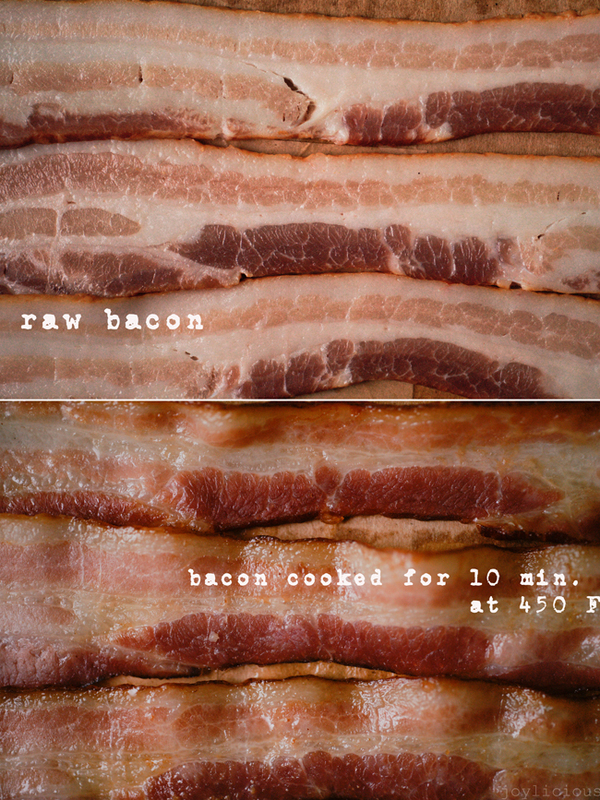 Place bacon in toaster oven at 450F for 10 minutes or until most of the fat has been rendered. (see photo above) Remove from oven and set aside on large plate lined with paper towels and drain. Peel and devein prawns. Wash under water and pat dry using a paper towel and set aside. Place bread into toaster oven or oven and bake at 300 F until partially dried, about 5-7 minutes. You can skip this step if your bread is already stale. Mince prawns using knife or food processor and mix with half of cut green onion and seasonings (fish sauce, sugar, pepper, cooking wine, sesame oil) in a medium or large bowl. Take 2 slices of bacon and mince finely and combine with the shrimp mixture. Add cornstarch and egg(s) and mix well. Spread on bread slices or rounds and flatten prawn mixture evenly with a knife (about 1/2 inch thick). Coat with sesame seeds and set aside. If you are baking them, place toasts into oven at 400F for 8 minutes. Take out of oven and wrap with bacon slices, using toothpicks to hold bacon in place. If you cut your bread into rounds like I have, cut bacon slices in half and wrap rounds with half slices of bacon. Use toothpick to hold the bacon in place. Return to oven and bake for an additional 10-15 minutes at 400F, or until bacon is crisp. If you are frying them, pour oil in hot pan. When oil begins to boil, put in bread slices (or rounds) and deep fry over medium heat until golden. Cut each square into 4-8 triangles (or leave rounds as is). Garnish with remaining green onions and toasted sesame seeds. Serve hot. You can serve this with our or any kind of dipping sauce you prefer. Serve these up at your next party and remember, you can make ahead and pop them in the oven whenever you're ready to serve. Happy Cooking!